Head Coach of Confluence Queens, Shola Adewuyi has expressed satisfaction with his wards 1-1 draw with Sunshine Queens in the match day one of the Nigeria Women Premier League. Both sides played out a 1-1 draw on Saturday at the Akure Township Stadium. Goodness Ihuoma scored the match opener for the homers in the 46th minute, while former Sunshine Queens player Kemi Famuditi equalised from the penalty spot with twelve minutes left in the game. In the dying moments of the thrilling match, substitute Ijeoma Obi had the chance to hand victory to the reigning Federation Cup champions but her spot kick was brilliantly saved by Seun Bello in goal for Confluence Queens. Speaking to Confluence Queens media team after the match, an elated Adewuyi couldn’t hide his joy at the result record in his first official game in-charge of the team in the NWPL. 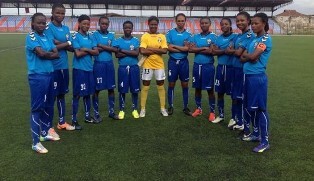 “I’m very happy to secure a point on the road considering the fact that this is my first official game with Confluence Queens," the former Waheed Queen tactician told Confluence Queens media team. “This draw is like a win for us because the match was played away and not at home,’’ he said. “Today’s result is a morale booster for us going into the next game, at least, we will be going all out for our first three points of the season in our week two match against Adamawa Queens. “We are urging our supporters to be patient with us. This team is evolving and we hope to continue improving as the league gathers momentum,’’ he added. Confluence Queens will welcome Adamawa Queens to the Confluence Stadium on Sunday 30th May for the week two of the new NWPL campaign.